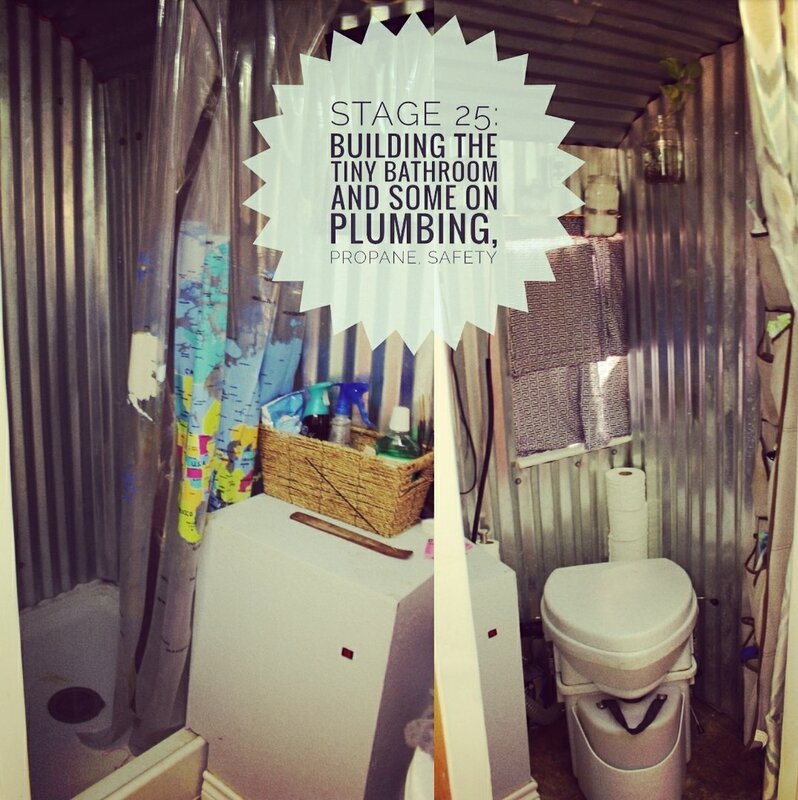 Building during the winter can mean different things for different people. Some people had to deal with snow and ice during their builds. Thankfully, we were in West Texas, but it would still get pretty darn cold! After the Christmas and New Year break and spending time with family in East Texas (about 8 hours from the bus) we got cracking back to West Texas and working BALLS TO THE WALL. We were excited, we had a better and more detailed plan, the lists we were making were getting longer, but we were crossing things off as fast as we could write them down. 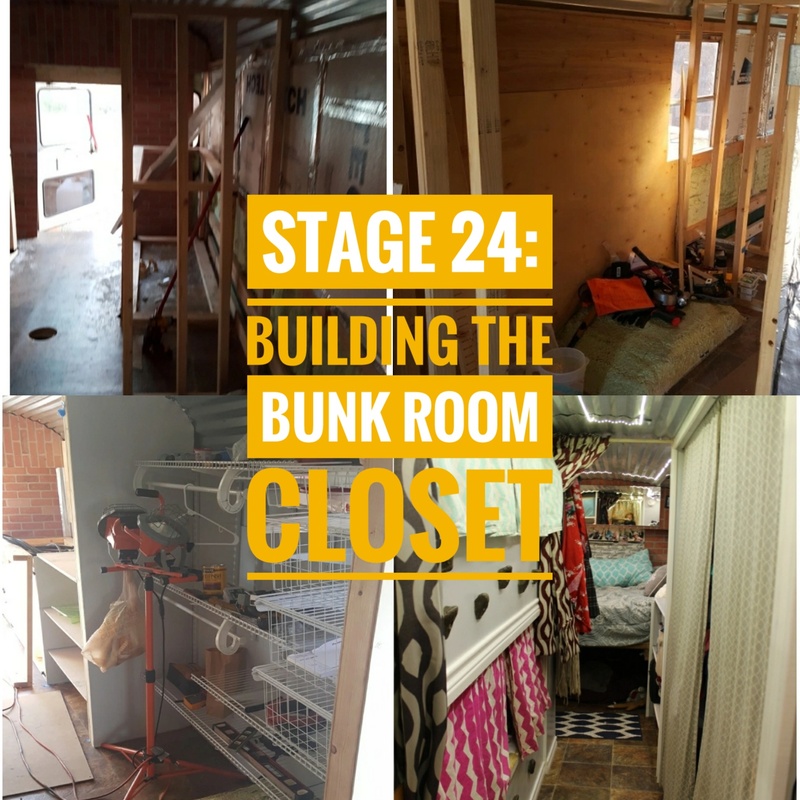 This was a really exciting time because we had just finished the bunk bed framing and walls and new we wanted that done so we could start the New Year full on building. Our imaginations were going nuts. Everything we did every day made it look a little bit more and more like a house. Like our house. With this in mind, and the current weather we were dealing with, we decided the bus was way too chilly. The windows were just not efficient for if we wanted to be in a cold climate. Not this many windows anyway. 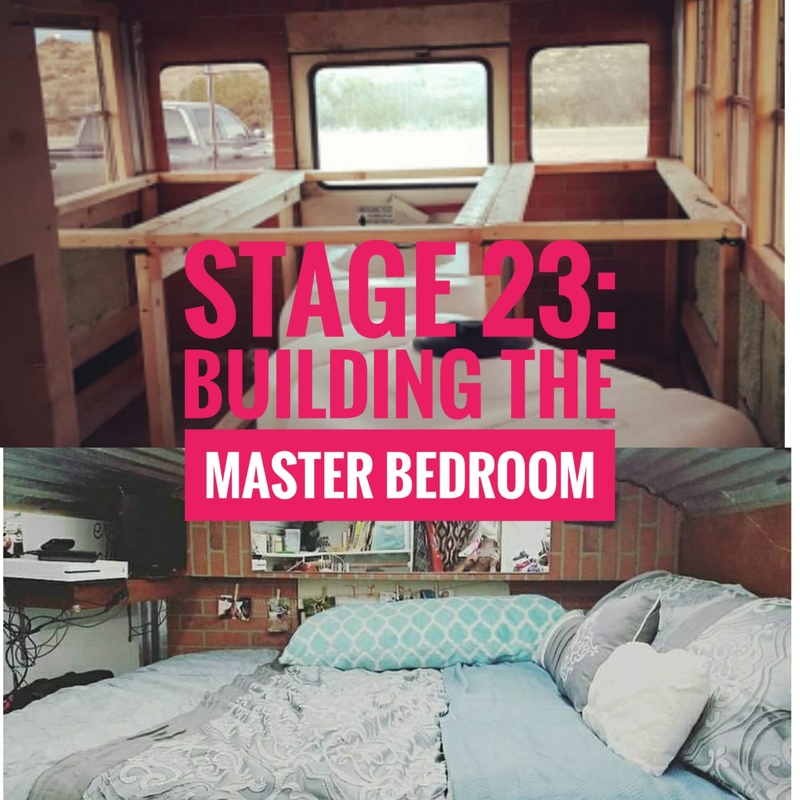 So, we decided (I show the later exterior pics of this decision in my earlier post Stage 16 Covering Windows to insulate and cover more of the bedroom windows and anywhere else it did not make sense to have them. I felt WAY more confident in this decision now because the bunk beds were built, which pretty much gave me a for certain measurement where my bathroom and kitchen would be. I was really able to move forward one something was solid and in place. We did plan for the build, but loosely. We really didn’t know how to approach it and just prepared as much as we could. A plan, subject to change. That is pretty much our life now that we live on the road and tiny! We used 1/2’” foam board on the windows, it fit nicely b/w the 2×4 studs and sat flush. Then we were able to tape it up with Foil Tape. This picture is the only one I have of the foil tape in use I believe. It works great! I love that stuff. It sticks really really well. Too well sometimes. But I have used it for multiple things, primarily insulating the windows. This tape seals any gaps so air can’t leak in. 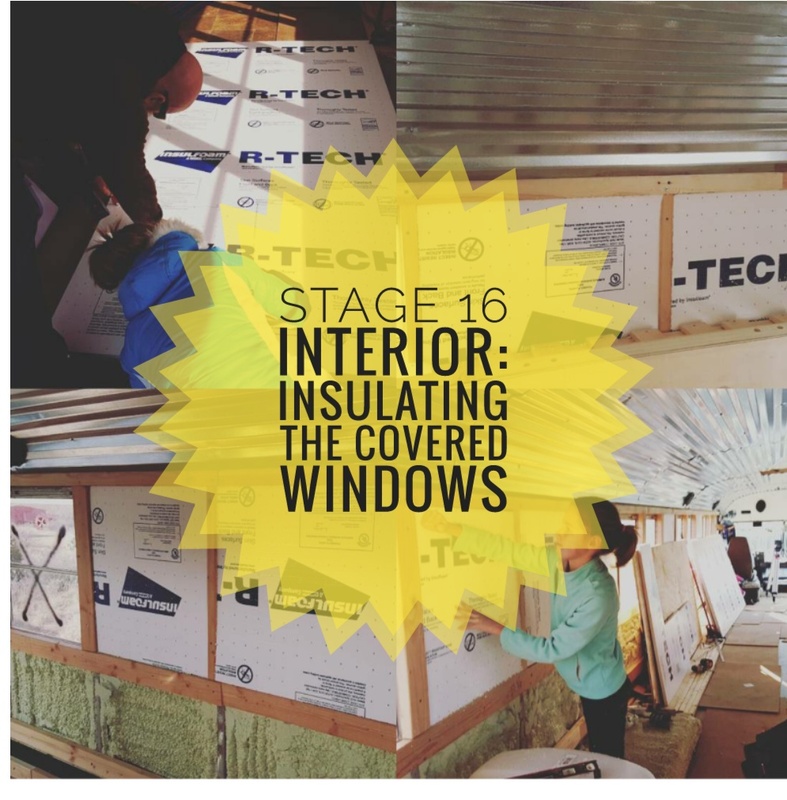 Besides insulating some Full windows, in our Master bedroom, kitchen, and living room we insulated the bottom half of the windows since the couch would cover them anyway. And let me tell you, I am glad we did. Even after spray foam insulating the entire walls and then a ¾” piece of plywood laid on top still does not prevent the heat from the exterior metal heating the wood up on the inside. If we have no shade, the heat can penetrate. So just remember that when you are deciding if you want to cover windows. We even took the back 2 windows out completely (we just smashed them lol) and then replaced the brick panels with a whole brick panel, you will see that in some future posts. Master Bedroom After Covering the back windows. Where are you planning on being mostly? What is the climate like? How cold is too cold for you? Too hot? Are you following the cool weather like we planned to? We did because we did not plan on installing an AC right away. So for a year we stayed where it was cool. Now we have an AC (one in front Emergency hatch area in Living Room/Kitchen) and it just doesn’t matter where we are! But insulating the bus with spray foam and covering some windows really really helped with this. Next Time: IF I knew then what I know now I would have taken all of the windows out and put in RV windows wherever I wanted them. Now…I know. And we know more about metal work and such…and more confidence! SO to help even more with insulating the windows now that we live in the bus I use reflectix inside of my curtains that I made to act as added padding. In humid climates, if its hot inside and cold outside, condensation will form on the windows. If they don’t get to dry, you will have mold. Anytime you have metal remember it can condensate. (Another reason to take your bus build down to bare metal! Insulate and put something else over the insulate. MAny people complain about the original metal siding condensating nd causing mold on their beds/cabinets/etc. Use a thermal barrier. My curtains are the barrier, but some people put reflectix in each window and that is it’s own barrier. Some people even use Bubble Wrap on their windows. YouTube Video about Heating and Cooling your Tiny Home!